"Brunelleschi" redirects here. For other uses, see Brunelleschi (disambiguation). The Santa Maria del Fiore cathedral in Florence possesses the largest brick dome in the world,   and is considered a masterpiece of European architecture. 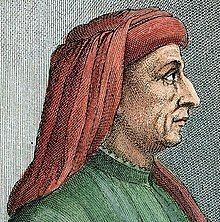 Filippo Brunelleschi (Italian: [fiˈlippo brunelˈleski]; 1377 – April 15, 1446), considered to be a founding father of Renaissance architecture, was an Italian architect and designer, recognized to be the first modern engineer, planner, and sole construction supervisor. He is most famous for designing the dome of the Florence Cathedral, a feat of engineering that had not been accomplished since antiquity, as well as the development of the mathematical technique of linear perspective in art which governed pictorial depictions of space until the late 19th century and influenced the rise of modern science. His accomplishments also include other architectural works, sculpture, mathematics, engineering, and ship design. His principal surviving works can be found in Florence, Italy. Brunelleschi was born in Florence, Italy in 1377. His family consisted of his father, Brunellesco di Lippo (a notary), his mother Giuliana Spini, and his two brothers. The young Filippo was given a literary and mathematical education intended to enable him to follow in the footsteps of his father, a civil servant. Being artistically inclined, however, Filippo was apprenticed to the Arte della Seta, the silk merchants' guild, which also included metal working, and became a master goldsmith in 1398. Thus, his first important building commission, the Ospedale degli Innocenti, came from the guild to which he belonged. 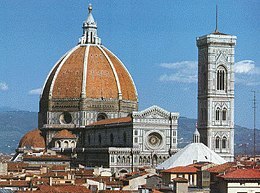 In 1401, Brunelleschi entered a competition to design a new set of bronze doors for the Florence Baptistery. Seven competitors each produced a gilded bronze panel, depicting the Sacrifice of Isaac. Brunelleschi's entry, along with the entry of Lorenzo Ghiberti, the winner of the competition, are the only two to have survived. Around 1400, there emerged a cultural interest in humanitas, or humanism, which held the art of Greco-Roman antiquity in higher regard than the formal and less lifelike style of the medieval period. However, this interest was restricted to a few scholars, writers, and philosophers before it began to influence the visual arts. In this period (1402–1404), Brunelleschi and his friend Donatello visited Rome to study its ancient ruins. Donatello, like Brunelleschi, was trained as a goldsmith, though he later worked in the studio of contemporarily well-known painter Ghiberti. Although the glories of Ancient Rome were a matter of popular discourse at the time, seemingly no one had studied the physical fabric of its ruins in any detail until Brunelleschi and Donatello. Brunelleschi’s study of classical Roman architecture can be seen in the characteristic elements of his building designs including even lighting, the minimization of distinct architectural elements within a building, and the balancing of those elements to homogenize the space. Brunelleschi's first architectural commission was the Ospedale degli Innocenti (1419–circa 1445), or Foundling Hospital. He had been given the commission by the Silk Guild in 1419. Interestingly, Brunelleschi’s name appears on the construction documents until 1427. This is nearly 20 years before the building was officially inaugurated. Its long loggia would have been a rare sight in the tight and curving streets of Florence, not to mention its impressive arches, each about 8 m high. The building was dignified and sober, with no displays of fine marble or decorative inlays. It was also the first building in Florence to make clear reference—in its columns and capitals—to classical antiquity. Soon, other commissions came, such as the Ridolfi Chapel in the church of San Jacopo sopr'Arno, now lost, and the Barbadori Chapel in Santa Felicita, also modified since its building. For both, Brunelleschi devised elements already used in the Ospedale degli Innocenti, and which would also be used in the Pazzi Chapel and the Sagrestia Vecchia. At the same time, he was using such smaller works as a sort of feasibility study for his most famous work, the dome of the Cathedral of Florence. Santa Maria del Fiore was the new cathedral of the city, and by 1418, the dome had yet to be defined. When the building was designed, no one had any idea how such a dome was to be built. It was to be even larger than the Pantheon's dome in Rome; no dome of that size had been built since antiquity. Since buttresses were forbidden by the city fathers, and because obtaining rafters for scaffolding long and strong enough (and in sufficient quantity) for the task was impossible, how a dome of that size could be constructed without it collapsing under its own weight was unclear. Furthermore, the stresses of compression were not clearly understood, and the mortars used in the period would set only after several days, keeping the strain on the scaffolding for a long time. The work on the dome, the lantern (built 1446–circa 1461) and the exedra (built 1439–1445) occupied most of Brunelleschi's life. Brunelleschi's success can be attributed, in no small degree, to his technical and mathematical genius. Brunelleschi used more than four million bricks in the construction of the octagonal dome. Notably, Brunelleschi left behind no building plans or diagrams detailing the dome's structure; scholars surmise that he constructed the dome as though it were hemispherical, which would have allowed the dome to support itself. Brunelleschi invented a new hoisting machine for raising the masonry needed for the dome, a task no doubt inspired by republication of Vitruvius' De Architectura, which describes Roman machines used in the first century AD to build large structures such as the Pantheon and the Baths of Diocletian, structures still standing, which he would have seen for himself. Brunelleschi kept his workers up in the building during their breaks and brought food and diluted wine, similar to that given to pregnant women at the time, up to them. He felt the trip up and down the hundreds of stairs would exhaust them and reduce their productivity. Besides his accomplishments in architecture, Brunelleschi is also credited with inventing one-point linear perspective which revolutionised painting and paved the way for naturalistic styles to develop as the Renaissance digressed from the stylised figures of medieval art. Brunelleschi made two panel paintings illustrating geometric optical linear perspective in the early 15th century. His biographer, Antonio Manetti, described this experiment in which Brunelleschi painted two panels: the first being the Florentine Baptistery as viewed frontally from the western portal of the unfinished cathedral, the other one is the Palazzo Vecchio seen obliquely from its northwest corner. These were not, however, the first paintings with accurate linear perspective, for Ambrogio Lorenzetti employed this in his Presentation at the Temple in 1342. The first Baptistery panel was constructed with a hole drilled through the centric vanishing point. Brunelleschi intended that it only be observed by the viewer facing the baptistery, looking through the hole in the panel, from the unpainted backside. As a mirror was moved into and out of view, the observer saw the striking similarity between the actual view of the baptistery, and the reflected view of the painted baptistery image. Brunelleschi wanted his new perspective "realism" to be tested not by comparing the painted image to the actual baptistery, but to its reflection in a mirror according to the Euclidean laws of geometric optics. This feat showed artists vividly how they might paint their images, not merely as flat, two-dimensional shapes, but looking more like three-dimensional structures, just as mirrors reflect them. Both panels have since been lost. Around this time, linear perspective, as a novel artistic tool, spread not only in Italy, but also throughout Western Europe. It quickly became, and remains, standard studio practice. In 1421, Brunelleschi was granted what is thought to be one of the first modern patents for his invention of a river transport vessel that was said to "bring in any merchandise and load on the river Arno etc for less money than usual, and with several other benefits." It was intended to be used to transport marble. In the history of patent law, Brunelleschi is, therefore, accorded a special place. In cultural and political terms, the grant of the patent was part of Brunelleschi's attempt to operate as a creative and commercial individual outside the constraints of the guilds and their monopolies. He was also active in shipbuilding. In 1427 he built a large boat named Il Badalone to transport marble to Florence from Pisa up the River Arno. The ship sank on its maiden voyage, along with a sizable chunk of Brunelleschi's personal fortune. Brunelleschi's interests extended to mathematics and engineering and the study of ancient monuments. He invented hydraulic machinery and elaborate clockwork, none of which survives. Brunelleschi designed machinery for use in churches during theatrical religious performances that re-enacted Biblical miracle stories. Contrivances were created by which characters and angels were made to fly through the air in the midst of spectacular explosions of light and fireworks. These events took place during state and ecclesiastical visits. It is not known for certain how many of these Brunelleschi designed, but at least one, for the church of San Felice, is confirmed in the records. Brunelleschi also designed fortifications used by Florence in its military struggles against Pisa and Siena. In 1424, he was working in Lastra a Signa, a village protecting the route to Pisa, and in 1431, in the south of Italy on the walls of the village of Staggia. These walls are still preserved, but whether they are specifically by Brunelleschi is uncertain. In addition, he was somewhat involved in urban planning; he strategically positioned several of his buildings in relation to the nearby squares and streets for "maximum visibility". For example, demolitions in front of San Lorenzo were approved in 1433 to create a piazza facing the church. At Santo Spirito, he suggested that the façade be turned either towards the Arno so travellers would see it, or to the north, to face a large, prospective piazza. Despite his status as an architect, Brunelleschi was a member of the goldsmith guild and in 1434 was arrested at the behest of the Masters of Stone and Wood for invading their monopoly. He was promptly released and the guild consuls in turn were prosecuted for false imprisonment. Brunelleschi's body lies in the crypt of the Cathedral of Florence. As explained by Antonio Manetti, who knew Brunelleschi and who wrote his biography, Brunelleschi "was granted such honours as to be buried in the Basilica di Santa Maria del Fiore, and with a marble bust, which was said to be carved from life, and placed there in perpetual memory with such a splendid epitaph." Inside the cathedral entrance is this epitaph: "Both the magnificent dome of this famous church and many other devices invented by Filippo the architect, bear witness to his superb skill. Therefore, in tribute to his exceptional talents, a grateful country that will always remember him buries him here in the soil below." Brunelleschi is portrayed by Alessandro Preziosi in the 2016 television series Medici: Masters of Florence. ^ Walker, Paul Robert (2003). The Feud That Sparked the Renaissance: How Brunelleschi and Ghiberti Changed the Art World. HarperCollins. p. 5. ISBN 0-380-97787-7. ^ "The Duomo of Florence | Tripleman". tripleman.com. Retrieved 2010-03-25. ^ "brunelleschi's dome – Brunelleschi's Dome". Brunelleschisdome.com. Archived from the original on April 16, 2010. Retrieved 2010-03-25. ^ Bodart, Diane (2008). Renaissance & Mannerism. New York: Sterling. ISBN 978-1402759222. ^ a b c Fanelli, Giovanni (1980). Brunelleschi. Harper & Row. p. 3. ^ Campbell, Stephen J; Cole, Michael Wayne (2012). Italian Renaissance Art. New York: Thames & Hudson Inc. pp. 95–97. ^ Edgerton, Samuel Y (2009). The Mirror, the Window, and the Telescope: How Renaissance Linear Perspective Changed Our Vision of the Universe. Ithaca: Cornell University Press. ^ Bruschi, Arnaldo (2006). Filippo Brunelleschi. Milano: Electa. p. 9. ^ Manetti, Antonio (1970). The Life of Brunelleschi. Translated by Enggass, Catherine. Pennsylvania State University Press. pp. 36–38. ^ a b Battisti, Eugenio (1981). Filippo Brunelleschi. New York: Rizzoli. ISBN 0-8478-5015-3. ^ Paoletti, John T; Radke, Gray M (2012). Art in Renaissance Italy. Upper Saddle River, N.J: Pearson Prentice Hall. pp. 203–205. ^ Meek, Harold (2010). "Filippo Brunelleschi". Grove Art Online. ^ Fanelli, Giovanni (1980). Brunelleschi. Firenze: Harper & Row. p. 41. ^ Klotz, Heinrich (1990). Filippo Brunelleschi: the Early Works and the Medieval Tradition. Translated by Hugh Keith. London: Academy Editions. ISBN 0-85670-986-7. ^ King, Ross (2001). Brunelleschi's Dome: The Story of the great Cathedral of Florence. New York: Penguin. ISBN 0-8027-1366-1. ^ Saalman, Howard (1980). 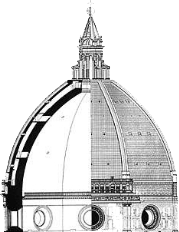 Filippo Brunelleschi: The Cupola of Santa Maria del Fiore. London: A. Zwemmer. ISBN 0-302-02784-X. ^ Prager, Frank (1970). Brunelleschi: Studies of his Technology and Inventions. Cambridge: The MIT Press. ISBN 0-262-16031-5. ^ Jones, Barry; Sereni, Andrea; Ricci, Massimo (2008-01-01). "Building Brunelleschi's Dome: A practical methodology verified by experiment". Construction History. 23: 3–31. JSTOR 41613926. ^ "The Medici Popes". Medici: Godfathers of the Renaissance. February 18, 2004. PBS. Retrieved October 2, 2011. ^ a b c Prager, Frank D (1946). "Brunelleschi's Patent". Journal of the Patent Office Society. 28: 120. ^ Manetti, Antonio (1970). The Life of Brunelleschi. English translation of the Italian text by Catherine Enggass. University Park: Pennsylvania State University Press. ISBN 0-271-00075-9. Argan, Giulio Carlo; Robb, Nesca A (1946). "The Architecture of Brunelleschi and the Origins of Perspective Theory in the Fifteenth Century". Journal of the Warburg and Courtauld Institutes. 9: 96–121. doi:10.2307/750311. JSTOR 750311. Fanelli, Giovanni (2004). Brunelleschi's Cupola: Past and Present of an Architectural Masterpiece. Florence: Mandragora. Heydenreich, Ludwig H. (1996). Architecture in Italy, 1400–1500. New Haven/London: Yale University Press. ISBN 978-0-300-06467-4. Hyman, Isabelle (1974). Brunelleschi in perspective. Prentice-Hall. Kemp, Martin (1978). "Science, Non-science and Nonsense: The Interpretation of Brunelleschi's Perspective". Art History. 1 (2): 134–161. Prager, F. D. (1950). "Brunelleschi's Inventions and the 'Renewal of Roman Masonry Work'". Osiris. 9: 457–554. doi:10.1086/368537. Millon, Henry A.; Lampugnani, Vittorio Magnago, eds. (1994). The Renaissance from Brunelleschi to Michelangelo: the Representation of Architecture. London: Thames and Hudson. Trachtenberg, Marvin (1988). What Brunelleschi Saw: Monument and Site at the Palazzo Vecchio in Florence. New York. King, Ross (2000). Brunelleschi's Dome: How a Renaissance Genius Reinvented Architecture. New York: Walker. ISBN 0-8027-1366-1. Saalman, Howard (1993). Filippo Brunelleschi: The Buildings. Penn State Press. O'Connor, John J.; Robertson, Edmund F., "Filippo Brunelleschi", MacTutor History of Mathematics archive, University of St Andrews . This page is based on the Wikipedia article Filippo Brunelleschi; it is used under the Creative Commons Attribution-ShareAlike 3.0 Unported License (CC-BY-SA). You may redistribute it, verbatim or modified, providing that you comply with the terms of the CC-BY-SA.